For the past few months I have been developing a PDF book bag pattern to share with you guys! Scheduled for release on November 23rd, it will be just in time for the Holiday gift-giving season. I’ve decided to name this pattern the Granger, after one of my favourite characters in Harry Potter, Hermione. This bag isn’t just for smart and sassy ladies though, it is perfect for anyone awesome who has places to go and things to carry! The Granger Book Bag pattern features two views, one with a messenger bag-style flap and one without. It has a fabric blocking around the bottom of the bag and flap, offering unique pattern and colour mixing opportunities. The Granger has an inside zipper pocket and kangaroo pocket, and view B has a small kangaroo pocket under the flap. The strap is included in the pattern, but can easily be made from bag strapping if desired. Coupon for your free PDF pattern on the date of the launch. Once the bag launches, there will be a four-part sewalong ending just before the Holiday Season. The Granger would make a lovely hand made gift for a friend or family member. Both version of the bag use a few pieces of bag hardware (rectangle rings, strap slider, and magnetic snaps). If you do not have access to bag hardware or would prefer not to buy any, I will do a post on how to make the bag without any hardware so you can still make your Granger! 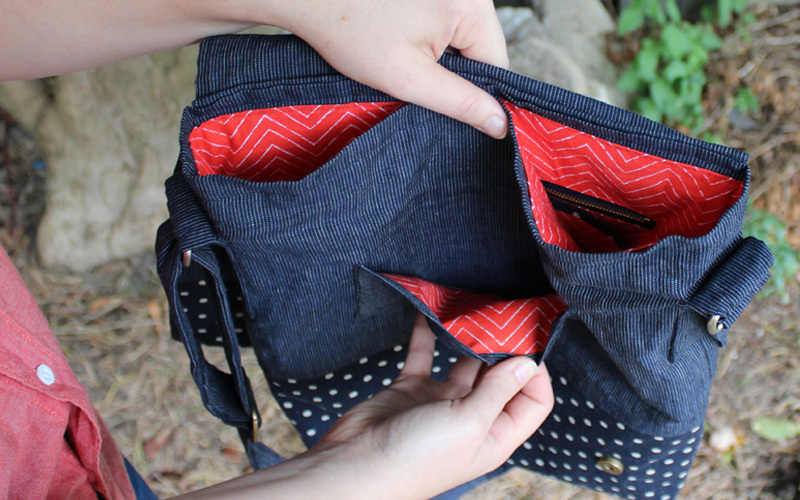 This week I made View B of the Granger Bag to show you the flap and extra pocket details. Expect to see View A on the blog in a couple weeks and don’t forget to get your free PDF pattern download! I was lucky enough to have Helen make this bag (without the flap; in a bright sunshine yellow & unbleached linen colour combination) for me for my birthday. I LOVE it. It is perfect travelling bag; easily holds a sweater, map, waterbottle, etc, in the main pocket, with a nifty inside pocket for smaller items, like keys & a phone. And I can easily wear it across my shoulders to keep my hands free for taking photos. If you are wondering about a gift to make your friends who like to travel, I would strongly recommend this bag; I take it with me everywhere i go! OMG Helen – I can’t even! I had sky high expectations but this is blowing my mind. I can’t wait to get the pattern and eagerly await more Granger news from the newsletter!! K, I’m gonna take a second to slow my roll here. Looking fabulous, Helen. I love the pockets! Your sample looks great! I love those fabrics too!